A camcorder comes almost first when people are planning to buy a consumer electronic product in modern life. People are able to capture special moments and precious memories and enjoy them in several years. It is easy for people to save these videos on pc hard drive, but it is even easier to lose them. An unexpected hard drive crash or wrong operation will bring you regrets as your memories were gone. A good video to DVD burning software is really cheap as well as the DVD discs. What you need is just a little time to burn them to discs. Unfortunately only a few people do this. A DVD5 disc can hold about 120 minute’s videos. A DVD9 disc can hold about 220 minute’s videos. It means that only a few discs will hold all your exciting moments. Here I will show you how to burn videos to DVD disc with easy and detailed steps. 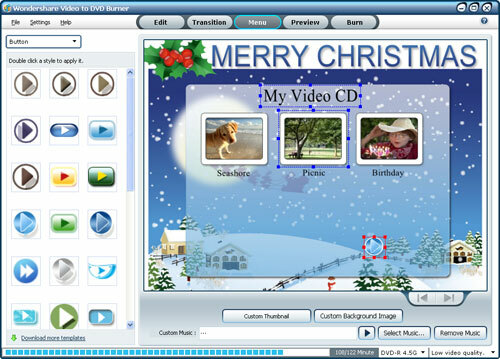 After these steps, you can burn videos in AVI, MPEG, MP4, MOV, etc into DVD video with customized DVD menu. First, load your videos and drag them into the timeline. You can classify them into several categories, say birthday party, spring picnic, summer seashore, and add them into different slideshows; every slideshow will create a single title. You can add different transition effects to the videos in the Transition tab, and you can preview them in real time. Then, choose a suitable DVD menu template. There are lots of DVD menu templates available; you can choose any one you love. You can customize the title thumbnail, change the background image and even add background music to it. The templates are all editable; you can change it to whatever you want. At last, put a blank DVD disc in your DVD burner and burn the videos to DVD. DVD disc has long data life, you just need to update the video to a new disc in a few years, so that you can keep these video all your life.